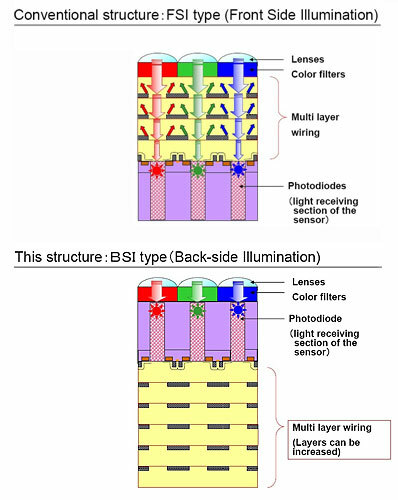 Back-side illumination (or BSI as Toshiba likes to call it) boosts light sensitivity by 40%, which should make up for the constantly shrinking pixels. That is because lenses are deployed on the rear of the sensor, not on the front, where wiring limits light absorption. Sampling of the new sensor will begin in December and mass production will follow from the third quarter of 2010. A 14 megapixel camephone as a present for Christmas next year sounds pretty good, right? Oh yeah, given enough processing power that thing is also capale of 1080p@60fps video recording.